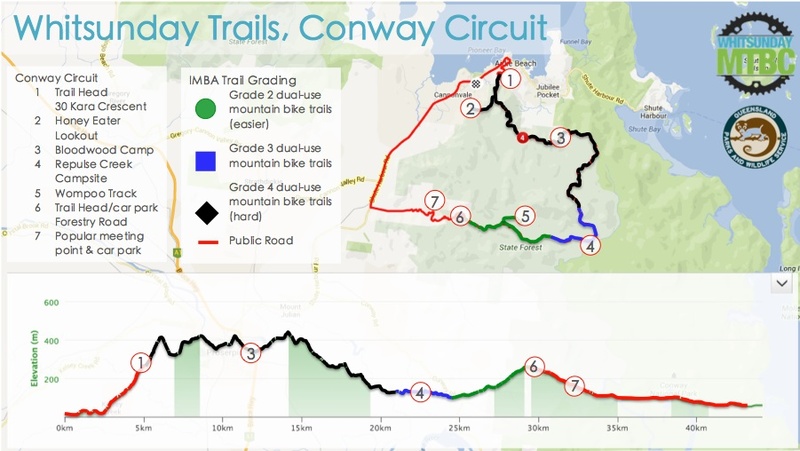 Conway National Park is home to the Conway Circuit (previously called Whitsunday Great Walk); a 28km point-to-point (1-6) multi-purpose trail open to mountain bikers and hikers. This trail is Difficult Black Grade and takes 4-5 hours but can be enjoyed by riding either end. This trail is quickly garnering a reputation for being one of Queensland’s most difficult trails to ride. We are honoured to have this trail in our network and love to encourage riders and visitors to enjoy it – but please ensure you are prepared for what lays ahead (and if possible, join one of our monthly WMTBC Rides). Black Grade trails mean Extremely Difficult. Suitable only for experienced mountain bike riders used to physically demanding routes. Navigation and personal survival skills are highly desirable. Expect large dangerous and unavoidable obstacles and features. Challenging and variable trail with long, steep climbs or descents and loose surfaces. Some sections will be easier to walk. Check out 3x Solo 24 Hour World Champion Jess Douglas’ review here! You will need to take a snack or two with you, 3L of water, spare tubes and tools to do a change. You will also need 4-5 hours to complete the ride. There is limited mobile access on the trail so ensure you tell someone responsible when you expect to be back. During the dry season (April – November) we recommend riding the trail from 1-6; starting in Airlie Beach and riding towards Brandy Creek. The trail head is at the top of Kara Crescent (call into the bike shop for some great local advice). During the wet season (December – March) we recommend riding the trail from 6-1; starting at Brandy Creek and riding into Airlie Beach. We recommend this because in the blue section of the trail there are two water crossings that are prone to FLASH FLOODING in the wet season – only cross these if the water levels are safe and stick to the designated crossing areas with mesh as the rocks/wood can get very slippery. The trail head is located half way between Airlie Beach and Proserpine, turn onto Brandy Creek Road and then continue up the gravel road onto Forestry Road all the way to the top where you will find a large car park. Take lots of water – there are water tanks on the trail but it should be treated before drinking. Insect repellent is recommended.